Put a finishing touch in your garden with a select garden stake for 50% off this weekend, Friday through Sunday. You can make refreshing iced teas from many of the plants and herbs in your garden. You’ll discover that a little experimentation with various herbs will result in interesting and refreshing iced teas that surpass any mix you can buy in the store. Start with a base of regular green tea. As you grow in experience you can use other favorite teas as a base. Green tea is a good one for starters because it is mild and mixes readily with other flavors. When used medicinally, these concoctions are called Tisanes. What we are going for here is refreshing flavor, so call it what you will! The process for making your tea is simple. Bring cool water to boil in a large stainless steel pot. While waiting for the water to come to boil, take a walk through your garden and gather two to three stems of each variety of herbs you want to flavor your tea. Wash them in cool water and bunch together with a clean rubber band. When the water is boiling, remove from the heat and add green tea bags. For my large stock pot, l use an entire box of green tea bags because I want it strong, you can always add water. After the tea bags, add your bunches of herbs and allow to steep overnight. The next morning, remove the bags and herbs to your compost bucket. Strain the liquid through a fine mesh strainer. This removes any stray leaves but more importantly re-aerates the tea which greatly improves flavor. Sweeten to taste, if desired with honey or Stevia products. Store the concentrate in a covered pitcher in the fridge, ready for drinking when you want it. Convenience tends to play a role in what gets done or used from the garden. 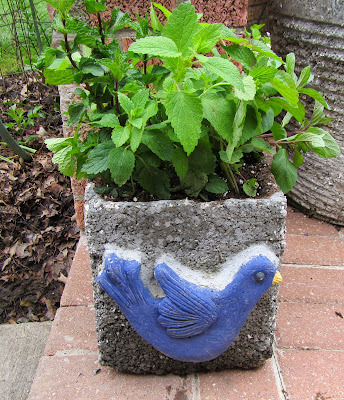 You can plant a TEA”Pot of your favorite herbs and keep it right near your door for easy harvest. 1. Fill the container ¾ full of potting soil and arrange your plants placing the taller growers to the center and the shorter ones to the outside. For this one I used Anise Hyssop, Curly Spearmint, Chocolate mint . Lemon Balm and Sweet Violet, a favorite combination. 2. Fill in the spaces with additional potting soil and water well. 3. Place in a spot easy to reach and let it grow! When Laurie and I go out to eat, I usually end up cleaning my plate. She however, will always eat half of her dinner and take the rest home because she loves leftovers. 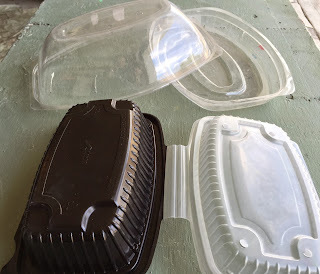 I am not fond of leftovers but am quite intrigued at the interesting variety of take-home food containers and have built up quite a nice collection. The “keepers” are a combination of a top and bottom which just happen to make pretty cool hypertufa pot and saucer molds. What a great way to reuse a take out container! 2. Lightly oil the inside surfaces of both the top and bottom pieces of your take out food container. 3. 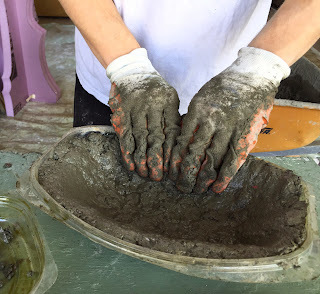 Put on a pair of disposable gloves and mix up; a batch of hypertufa. You can make this project using just sand mix concrete mix but the end result will be much heavier. 4. Line the insides of both pieces with ½” to ¾” layer of hypertufa and pat firmly using your fingers to a uniform surface. 5. Use your finger or a stick to poke a drainage hole in the bottom of the planter portion. Don’t put a hole in your saucer. 6. Allow to set and harden overnight and pop out of the plastic containers. You can slit the plastic with a box cutter. This will make it very easy to remove. 7. Brush off rough edges and allow to cure for a week. 8. Pot up and place when you want some living color. Wanna know what you'll find at our spring sale, Breath of Fresh Air? Click on the sun and take a look! Meet three new angels at From the Summer's Garden. St. Fiacre was born in Ireland and sailed over into France in quest of closer solitude. He was offered as much land as he could turn up in a day and cleared the ground of trees and briers, made himself a cell with a garden, and made a hospice for travelers which developed into the village of Saint-Fiacre in Seine-et-Marne. 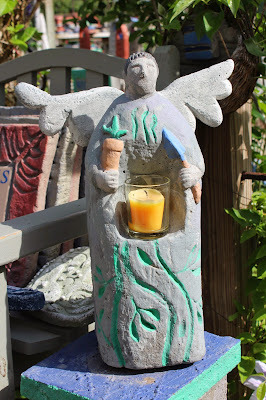 Thus St. Fiacre became the patron saint of gardeners. This angel sculpture is inspired by St. Fiacre, patron of gardeners, and features a small niche for a votive candle. The second angel celebrates love for gardens and and the growing beauty in our world. 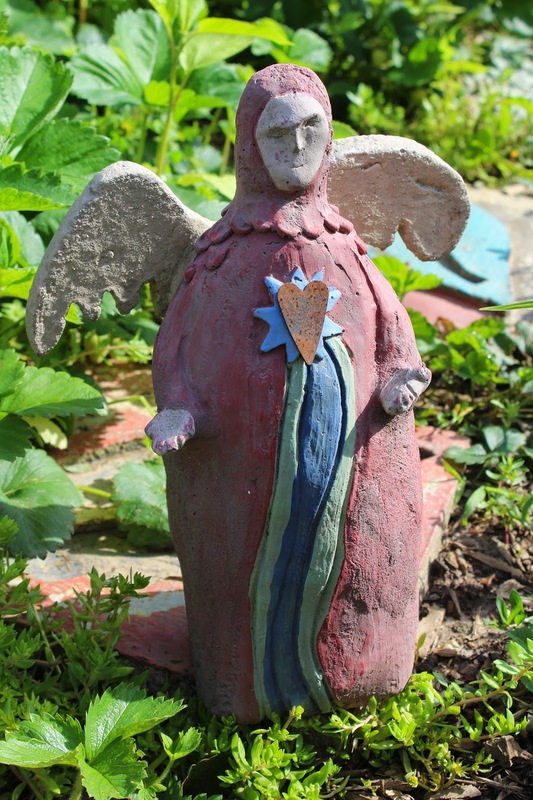 The garden in May, full of bloom and new life is a perfect setting for this angel. 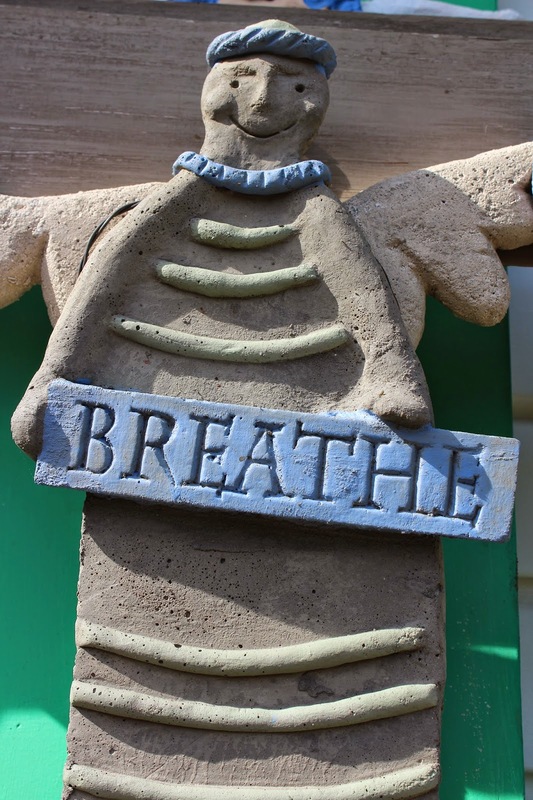 Our third new angel urges you to take a breath of fresh air and calm your soul. Come meet these three new angel sculptures at Breath of Fresh Air, Friday, Saturday and Sunday from 10:00-5:00. We're open even in the rain which is always a blessing! QUILT GARDENS MAKE HARVESTING EASY! 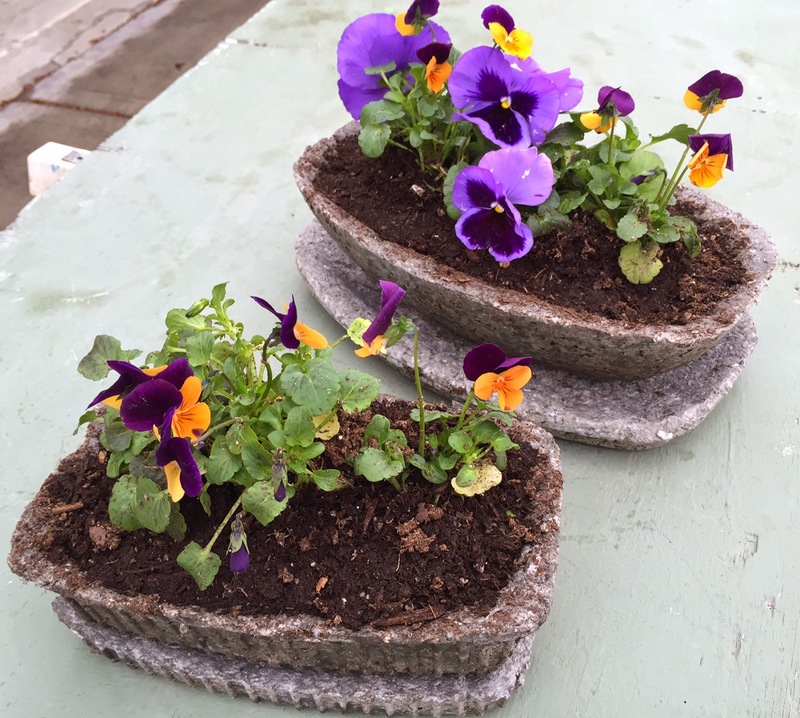 From the Summer's Garden offers a wide selection of garden stepping stones and as their name implies, most of the time they are used to pave pathways throughout a garden. 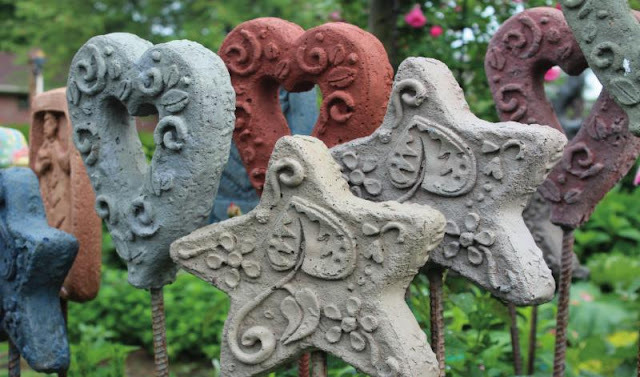 We have a fun colleciton of quilt stones that not only serve as pavers but also as building blocks to garfden design. 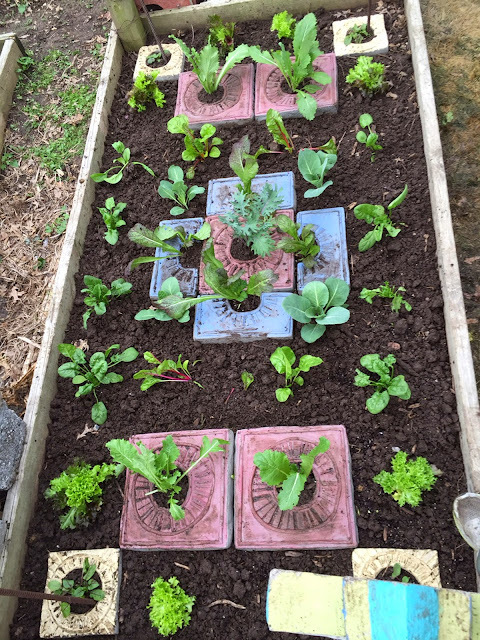 Laurie and I had a ball planting this salad garden where the structure was defined by a quilt-like pattern . Oncethe stones were placed, it was like filling in segments of a quilt design using plants. Plants used include mesclun mix lettuces, spinach, swiss chard, kale, red mustard greens, red sorel and a new cabbage like plant that is supposed to be great for veggie roll-ups. You can see the entire quilt stone collection at Breath of Fresh Air, open Fridays, Saturdays, Sundays and Memorial Day in May. 10:00-5:00.